This collection celebrates the music of John Tavener, one of the best known and popular composers of his generation. It brings together performances by Canty, The Wallace Collection, Scottish Ensemble and Elena Riu. John Tavener, who passed away in 2013, was described as "among the very best creative talents of his generation" by The Times. Tavener wrote the extraordinarily moving ...Depart in Peace... following the death of his father. Written for soprano, violin, tampura and strings it features Eastern elements and a glittering setting of the Song of Simeon. Patricia Rozario and Cleo Gould are outstanding soloists in this beautiful piece. 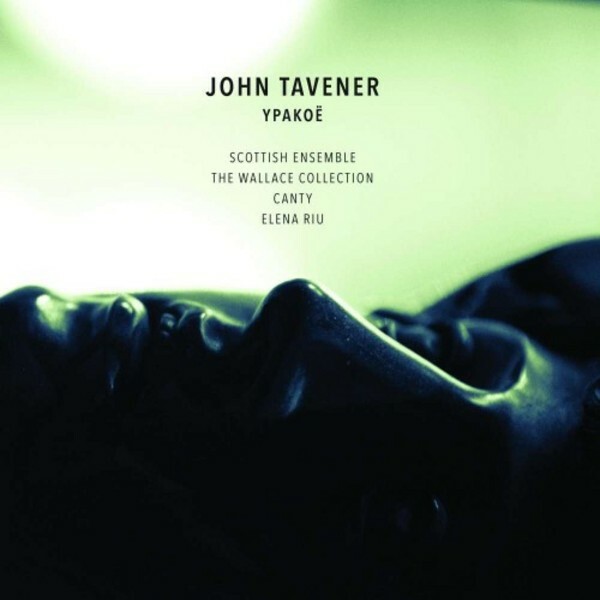 Originally pronounced unplayable, John Tavener's Trisagion was premiered by John Wallace in 1985 who recorded it with his own ensemble, The Wallace Collection. Containing Stravinskian flourishes whilst balancing fanfare-like passages with solemn chorales, the players more than meet the virtuosic challenges. Written especially for them, Canty gave the world-premiere recording of Two Hadiths which explores the sonorities of the bray harp in meditative settings of the poetic sayings of the Prophet Mohammed. The title work Ypakoe, a series of meditations on the death of Jesus, was specially written by Tavener for Elena Riu and originally premiered on her recording 'Piano Icons for the 21st Century', which was a Gramophone 'Critics' Choice': "my disc of 2000 is without hesitation Elena Riu's extraordinarily fine CD". Re-defining the string orchestra, the 12-strong Scottish Ensemble is the UK's only professional string orchestra. Versatile and vibrant, they are as much at home with contemporary music as the Baroque. Formed to explore and perform the extensive brass repertory, The Wallace Collection has become one of the world's pioneering brass ensembles with an international reputation for innovative programming. Canty, Scotland's own Anonymous 4, is Scotland's only professional Medieval music group. It comprises the regular female singers with Cappella Nova, Scotland's leading early music vocal ensemble. Hispano-American pianist Elena Riu is an inspiring artist renowned for the intimacy and lyricism of her playing, which led John Tavener to write her his first major solo work for piano in over twenty years.